Segebadenpulkan is back and is now owned by Dan and Martin from Föllinge Såg AB. 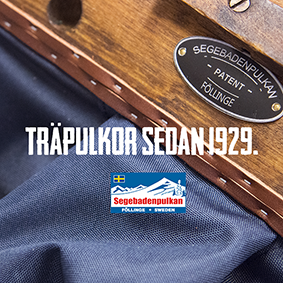 The brand of Segebaden is from 1893 and the production of pulks began in the 1940s. With that in mind, it feels important that we as owners go about the right way from the beginning, and live up to the brand Segebaden rather than hurrying to take back lost market shares. Most people have a relationship to Segebaden, our wooden pulks evokes strong memories of trips in the backcountry with all you need packed the pulk while skiing quietly through nature. We were both rocked to sleep in a wooden pulk from Segebaden and perhaps it is those years that made us want to make sure Segebaden continues to live on. Our feeling for wood as a material comes through an over 100 year tradition of Föllinge Såg. Here you can restore the pulk your grandfather or grandmother slept in as a child, or build a new one with the same technology and materials used more than 60 years ago, when the pulka production started. Our ambition is that the way we use the Pulk, continue the tradition of highly functional and reliable pulks for the mountains, with new materials but with the same idea, simple and functional, with a touch of innovation and solutions that have yet not been on the market. It is our desire that you, our customer should be able to enjoy our products for many years of both long and short trips.